Captivating full of style yet unique Stacey Israel's Jazz Quartet just as easy on the ears as the eyes. Professional musicians who have performed in some of the best music venues in the area;Tula's Jazz Club, Ballard Fire House, Bogarts, Vina Bella, Local Color, Vivendo's and Mobile Espresso. Private parties, Weddings. Community Festivals such as Black community Festival, Bumbershoot, Umoja, and Crossroads mall. Corporate Holiday events at Neiman Marcus and Microsoft as well as Casinos. Versatile and seasoned this Jazz band will WOW you as they sprinkle shows with a little taste of fabulous originals while their repertoire of well known music keeps you entertained weather you want to dance, sit and dine, mingle or relax and be entertained either way you will find Stacey Israel's Jazz Quartet amazes and engages you. 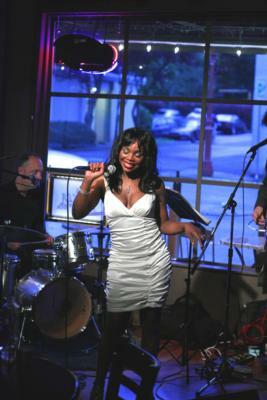 Within Stacey Israel Jazz quartet musical talent goes beyond live performance. Songwriters Composers Producers Recording artists with pro work for instance "I don't know what 2 Say", Stacey Israel's number one video, single available on iTunes and of course You Tube "Merry Christmas my Savior Lives" her original Christmas song singing with the Daughters of Zion Gospel group. "Go ahead Boy" an original ballad is featured in rotation on Women of Substance Radio, and Airplay. "I need your Loving" title song of her 12 song album including "I Wanna Do Ya" featured on Cube and Kriz radio in the 90's where she opened up for Color Me Bad back in the day. Jazz, R&B Blues, Soul, Gospel, Brazilian, African, and Native American influences resonates in this fabulous group with Members Yogi McCaw, Bob Antolin, and Burt Boice also are in the Yoginis Word Jazz Band Amazing musicians all the way around. *Check out some great reviews from the other band related profile we work with, Ed Mays Groove Kitchen. Please note Stacey Israel Jazz Quartet +1 will also travel to Bothell, Maple Valley, Kirkland, Bellevue, Kent, Medina, Renton, Ravensdale, Kenmore, Seattle, Snoqualmie Pass, Black Diamond, Auburn, Lynnwood, Enumclaw, Issaquah, Rollingbay, Seahurst, Indianola, Everett, Federal Way, Manchester, Pacific, Southworth, Burton, Mercer Island, South Colby, Fall City, Gorst, Keyport.